The BALTECH thermal imaging ThermaRed Series are intended to perform control and diagnostics of temperature fields of objects (e.g. electrical equipment, mechanical equipment, energy audit of enclosing structures, transport, building quality, medicine, research activities). 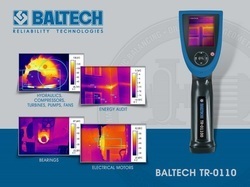 The infrared cameras BALTECH TR are low cost and have a user-friendly interface, small size and low weight. All the models of the infrared cameras look like a video camera and consist of a portable housing, lens, display and a focal plane array. The infrared cameras have several languages, which eliminates any language barriers. The cameras can be connected to PC via the BALTECH Expert software for thermal image analysis and database management.